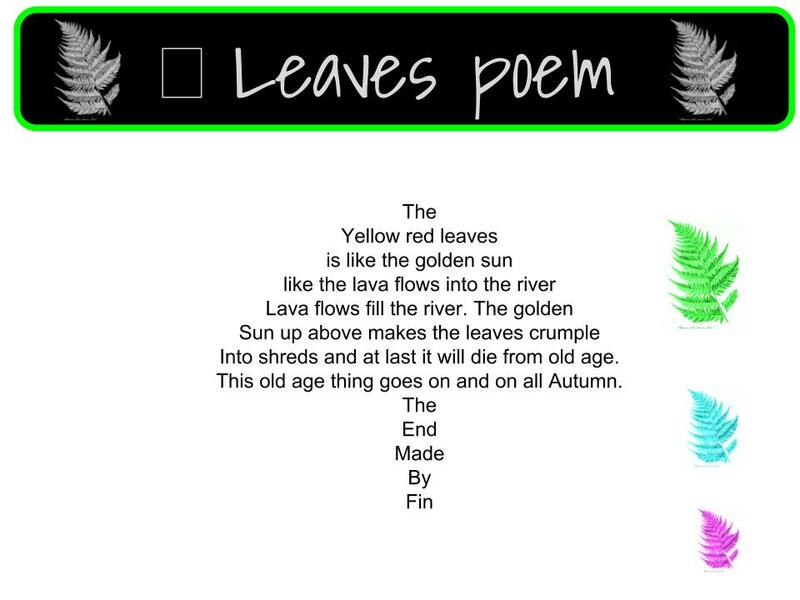 Team Awa - Year 3/4 - Ohaeawai School: Leaves, wonderful leaves. 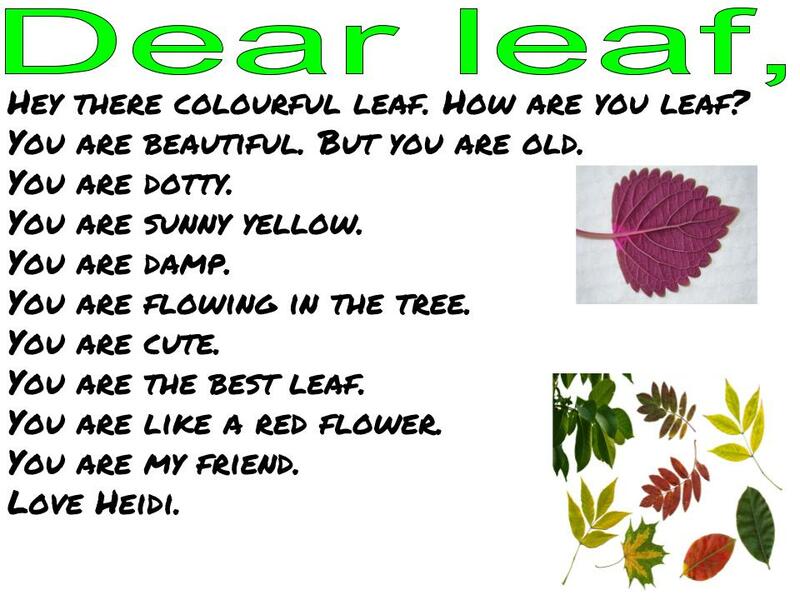 We used leaves to inspire our writing last week. Here is some of our wonderful writing/poetry. the sun and white like the moon. You fluttered down into my hand. Crunch! you sing. Every day you curve up, please don’t die. my friend. Green veins in you. Went a lava leaf as it flew down like a magic carpet. Smooge!! Went the leaf as it hit the ground like an aeroplane cruising in. A gust of wind hit the old oak tree and leaves fell like lightning as they charged at the ground. They formed a gooey lava mixture and glooped towards me. The spines reminded me of the soldiers in WW1 and WW2. Where do they go? Probably around the world and back again before moulding into the soil so new plants can sprout and a new environment can form. It keeps on going around and around and can’t be stopped. 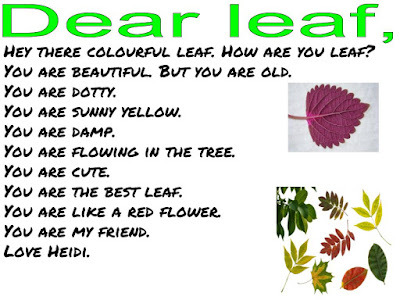 Leaves are a hope of the environment and nature can survive and life can move on. Thanks for sharing your fantastic poems. I LOVE autumn leaves, their colours are spectacular! It is my favourite time of year for trees! When I see a pile of autumn leaves on the ground I just want to jump in them and hear them crunch. 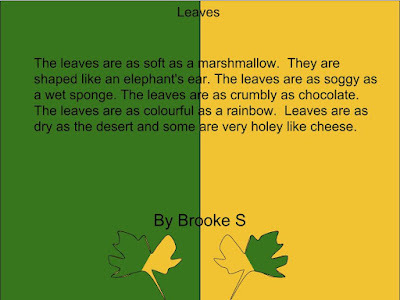 You are right Brooke, sometimes they are as crumbly as chocolate. I like how you describe them falling to the ground Ronan, soft and silky fluttering down. Do you have lots of autumn trees losing their leaves in your playground at Ohaeawai School? Do you make big piles of leaves and throw them in the air? Great poetry everyone! Thanks for sharing. 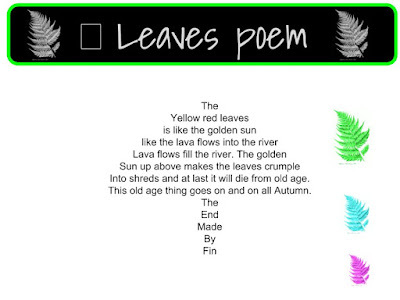 hi jai here I like this this poems I like the way it looks like a leaves it is so so so cool.